Trump letting Mattis decide Afghanistan troop levels. By letting James Mattis decide U.S. strategy in Afghanistan, Trump is proving once again how unfit he is to lead. 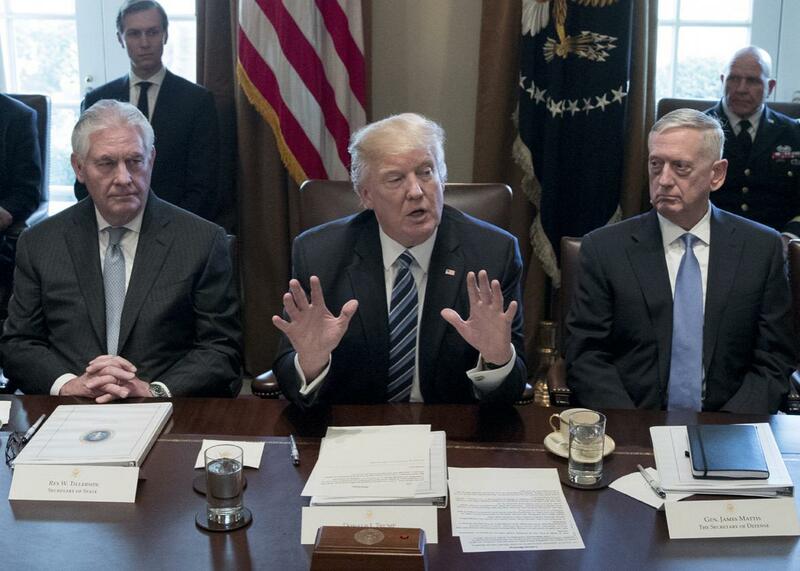 President Donald Trump holds a meeting with Secretary of State Rex Tillerson and Secretary of Defense James Mattis in the White House on March 13. President Trump has decided to let Secretary of Defense (and retired four-star general) James Mattis set U.S. troop levels in Afghanistan—a move that amounts to yet another indication, in some ways an admission, that the commander in chief is not up to the job. It would be one thing if Trump laid out his political and strategic aims in the war, then let his military chiefs calculate how many troops would be needed to accomplish those goals. This is what presidents usually do, though some take the chiefs’ advice as just that—a proposal, which they can accept, reject, or modify—rather than as a dictum. But Trump hasn’t done that. (By contrast, President Obama ordered a review after one week in office, then chaired 10 National Security Council meetings to discuss the subject.) What is the goal of the war—to defeat the Taliban, to defeat only the jihadi fighters, or to drive one or the other to the negotiating table, and if so, with what desired end-state? Should U.S. troops engage in combat or just train and assist the Afghan army, and, if the latter, how close should they get to the battlefields? Is it possible to win this war (and what does win mean? ), if the Afghan regime remains corrupt? If not, are there ways for us to help the regime reform? And if not, should we phase out our involvement? These are some of the basic, and momentous, questions that a new president should be asking in this war’s 16th year. President Trump has fluffed the obligation and passed it to Mattis. Maybe he concluded the questions were too hard. They are hard; being president is hard (as Trump has discovered to his surprise). Maybe he doesn’t want to be held responsible if the war stalls in stalemate or worse, just as he tried to blame his generals for the failed raid in Yemen at the start of his term. Trump, at least for now, has decided to let the retired general running the Pentagon do as he pleases. He has abdicated his powers as commander in chief, and maybe that’s not entirely a bad thing; no doubt Mattis, for all his limitations, has a keener strategic acumen than Trump. But Trump should realize that presidents are held responsible for every decision made in their tenure. Letting a Cabinet secretary make the call does not let him off the hook; deciding not to decide is itself a decision. And in this case, Trump has decided to prolong and intensify our involvement in this war—to what end, no one can say.